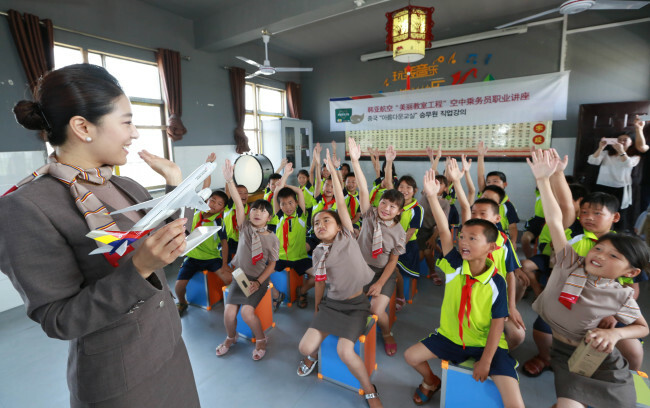 Asiana Airlines said Thursday that the company has partnered with Luotian Elementary School in Jianxi province, China, to provide support for children’s education. The partnership ceremony was attended by Moon Myeong-young, Asiana’s executive vice president for passenger business, Vice Consul General Seo Yong-won of the Korean Consulate in Wuhan and Peng Kai Xian, head commissioner of the Anyi County People’s Government. At the ceremony, Asiana presented the school with two air conditioners, 1,000 school uniforms and 600 items including desks and school supplies. The partnership is the latest in Asiana Airlines’ Beautiful Classroom Project, which works with schools in China to provide school supplies and volunteer services. Asiana has been running the project since 2012. Luotian is the 27th school to be selected for the project.